The Daleks have been around for over fifty years now, and so doing something new with them while staying true to their character is a difficult task. 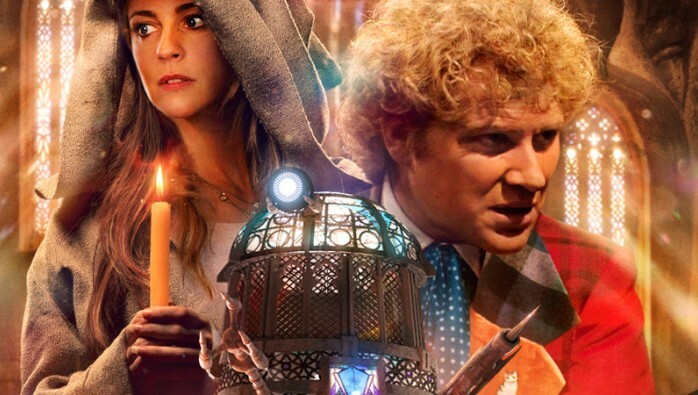 But the cover and promotional art for Order of the Daleks, the latest in Big Finish’s monthly range, boldly flaunt its new take – a Dalek of stained glass. Before they meet this colourfully designed villain, the Sixth Doctor and his companion Constance Clarke land on Strellin, one of those medieval planets which somehow still have similar religious orders to Earth. They're lead to a monastery, where the Brotherhood of the Black Petal are guarding a mysterious secret... yeah, alright, that secret is the Daleks. The fact that it’s a small number of wounded Daleks allows this story to take on a smaller-scale yet more horror-inflected tone than the more epic stories of, for example, the War Doctor series. This is something that writer Mike Tucker pulls off effectively, with some genuinely scary moments. The stained-glass Daleks of the cover, their casings repaired by the monks, are either a great visual idea or a very silly one – opinions will be divided on this. Colin Baker’s on fine form as the Doctor and it’s good to hear his relationship with the inexperienced yet practical Constance develop. John Savident is perfectly cast as the petty, arrogant Pendle, who comes at odds with the Doctor to amusing effect, particularly in the story’s early sections. Olivia Hallinan’s Asta gets the story’s strongest character arc, as she must step out from under the shadow of her overbearing superior. Starburst 431 - Out Now! Doctor Who Adventures 20 - Out Now!